I am at that season in my life where I have a lot of friends getting married and having babies — in September I went to two weddings in back to back weekends! I am always looking for little gifts for showers, things that my friends can use to pamper themselves a little. How great is that?! 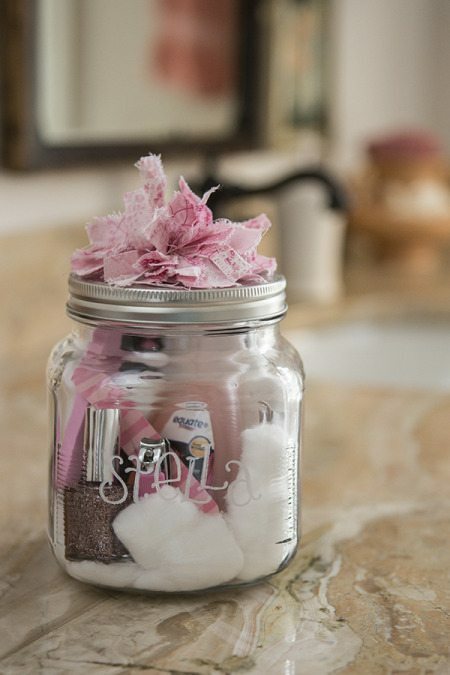 And what a cute, simple idea for a gift that you know will get used! There isn’t really a need for a tutorial for this project, but make sure to visit So Shelli to check out her other fun ideas. Why is it that everything is so much better in a mason jar? Great idea …. simple but elegant and useful.